For nearly 20 years the author and family used their house in Owls Head as not much more than a vacation spa to recover from the stresses of suburban Massachusetts. But when he retired, with time to explore and think and write, he crossed some kind of line, into much more intimacy with the place. Owls Head is ordinary, except if you walk through its neighborhoods, on ocean shores and country lanes, on points of land, undeveloped woods and saltwater marshes, even through a couple of housing developments, and then Owls Head becomes the kind of place many may seek: magically ordinary, a place of beauty and history, contradictions and community. Over the course of a year, the author visited anew, walking every lane and road and trail, even a few driveways, in town. The record of these modest walks became a book of discovery and enlightenment. 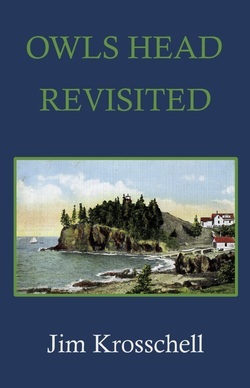 Praise for Owls Head Revisited. Jim Krosschell divides his time between Owls Head, Maine, and Newton, Massachusetts. After a career in science publishing in the Boston area, he began writing much more regularly, and more than 50 journals and magazines have published his personal essays (and versions of several of the chapters herein). 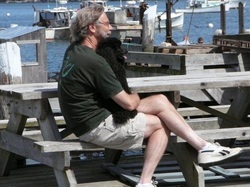 Besides writing and contributing to the welfare of the Maine Turnpike, he is also president of the Board of Directors, Coastal Mountains Land Trust, in Camden, Maine.